ADEC Technologies is a Swiss manufacturer of privacy-protecting people counters and non-intrusive road-traffic detectors. The Observer One is the primary choice for all indoor people-counting applications that require highly accurate counts as well as complete protection for the privacy of the people being counted. 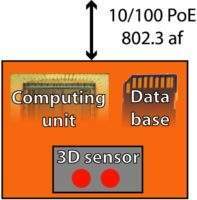 Multiple observer devices can be combined to build arbitrarily large, coherent detection zones that act like a single field of view. 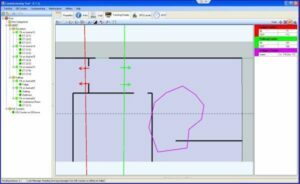 Counting lines as well as polygon-shaped counting zones can easily be created using the Windows-based commissioning software, which can also be used as front-end for visualisation purposes, such as signage applications. 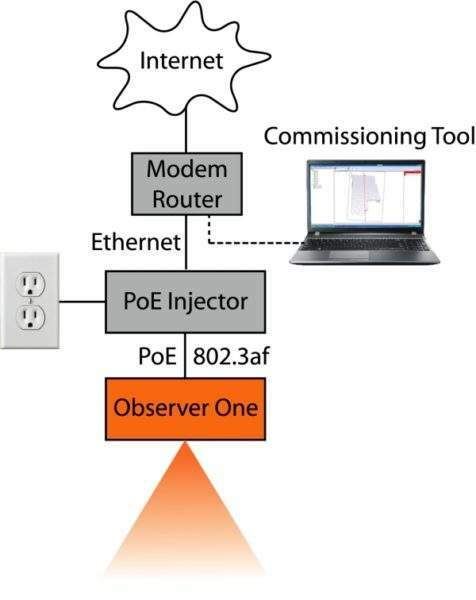 ADEC’s Observer One is an all-in-one, PoE-powered (802.3af compatible) device that is designed for indoor people-counting applications in areas that are not affected by direct sunlight and that can provide a mounting point at 4m (13ft) or less above the counting zone. 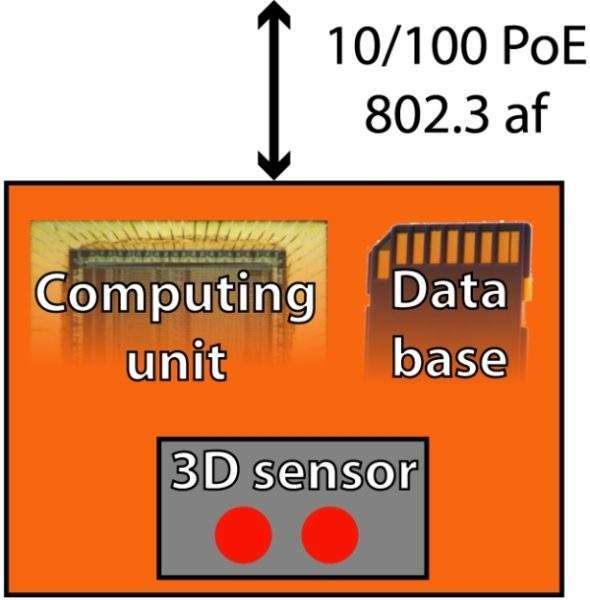 The device uses structured light sensing technology, which provides high-resolution point-cloud data delivering high-accuracy counts of 99% and at least 96% in challenging traffic. 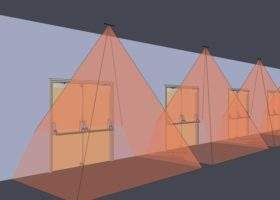 To increase the detection zone, for example to monitor a larger entry or exit point, one or more additional observer units are connected to the network and mounted adjacent to the existing unit(s) to enlarge the detection zone. Unlike common video-based systems, where privacy is often of great concern, the Observer One counting and tracking solution inherently protects the privacy of all the passing people since it does not have nor use video for its analytics. 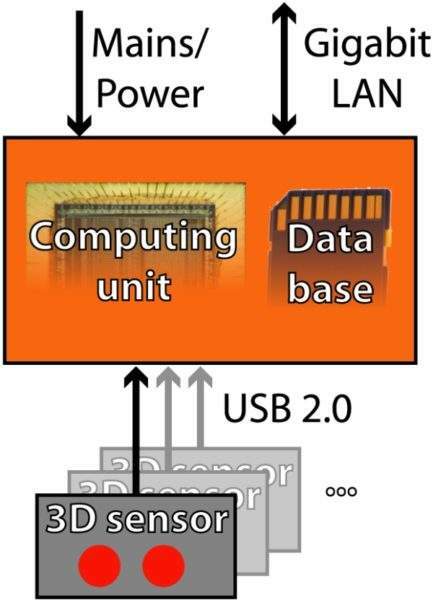 Additionally, the Observer One unit is set-up in very little time because the system does not require training; a single unit installation does not need any walk-testing, two or more units require a person to walk between the individual detection zones a few times to calibrate the relative position of the units to one another. To complete the setup, single / straight counting lines and/or polygon-shaped counting lines are drawn. All track data is stored in each Observer One by default, external storage of raw track-data is easily accomplished as long as the target database features an ODBC interface. The Observer II, consisting of an industrial PC that can accommodate multiple 3D sensors via USB, is the ideal choice for privacy-protecting people tracking in larger areas. It provides a cost-effective solution for applications that inherently require a larger detection zone. Observer II combines multiple fields of view for an aggregate detection zone that acts like a single field of view for counting and tracking purposes. Both Observer One and Observer II counters and trackers can be arbitrarily mixed and matched to optimally cover a given area. An efficient and user-friendly commissioning process is pivotal for any system that involves complex parts such as networking and databases. The Observer Commissioning and Visualization Software is exactly that; it allows both installers and technicians to quickly and easily commission an installation in a simple and user-friendly manner. 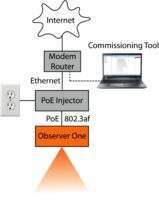 Devices automatically report their presence to the commissioning tool, provided they are on the same subnet as the PC that runs the software tool. There is no need for lengthy walk tests and teaching sessions. 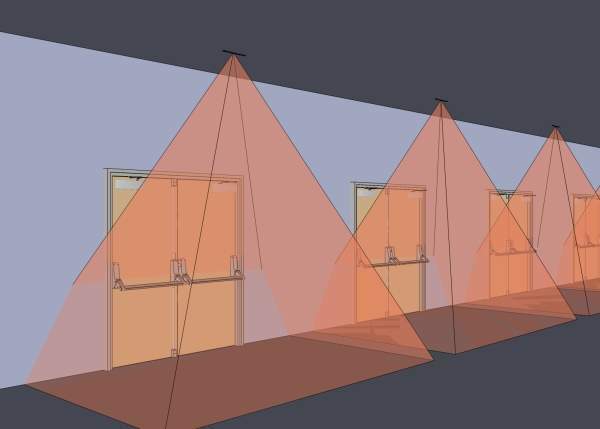 Single-sensor installations require no walk-testing, while systems with two or more sensors require a quick walk-through that enables the sensors to align their field of view in relation to each other to build the aggregate, coherent detection zone. 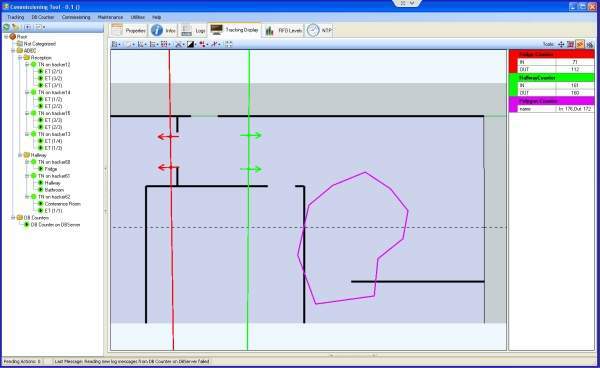 The visualisation component of the software allows operators to load floor plans, display location and track data as well as live-counter information. Each device maintains a detailed log that permits quick identification and resolution of problems that may arise during the installation or operation of the system. The tracking process acquires the coordinates of every person more than a dozen times per second. Needless to say that raw tracking data accumulates quickly to consume substantial storage. 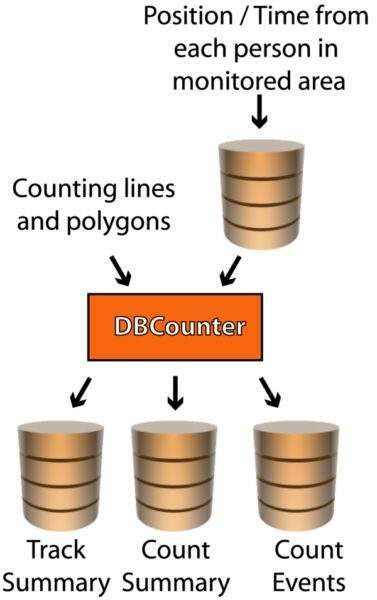 ADEC DBCounter software condenses that data to counts by applying the counting zones and counting lines the user has defined on the track data. Raw track data is stored inside the observer unit by default; however, any ODBC-capable database can be configured to receive raw track data. The DBCounter software, which ideally is hosted on the same machine that holds the database it accesses, can also transmit count data on an event-driven basis to any sever via UDP in easily customisable datagrams. The decentralised nature of the system supports any number of databases to optimally satisfy any imaginable setup. 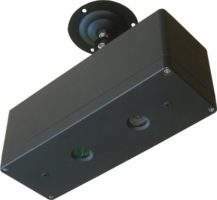 ADEC Technologies is a Swiss engineering and manufacturing company of non-intrusive road-traffic detectors and privacy-protecting people counters. The owner-managed company was founded in 2009 and established itself as supplier of quality traffic detectors for the ITS industry. Recently, the company added privacy-protecting, high-accuracy people counters and trackers to its offerings. Interested in learning more? Get in touch by using the form below. ADEC Technologies has announced that it will exhibit at the Inter Airport Europe exhibition in Munich, October 6-9, 2015. The company plans to show its next generation of people tracking and counting products as well as the new parking occupancy space detector for cloud-integrated parking space management. ADEC Technologies produces anonymous crowd-surveying systems so that clients can analyse how individuals interact with their environments. The town of Chur, Switzerland, owns an event hall, operated by Chur Expo AG. Various events are hosted in the facility throughout the year, from local tradeshows and concerts to the traditional Oktoberfest. The facility can accommodate up to 6,500 people. Cardiff Airport, Wales, UK, welcomes in excess of a million passengers a year, serving scheduled airlines and charter tour operators. The airport has more than 50 direct destinations and more than 800 one-stop destinations around the world. ADEC Technologies today announced the immediate release of the Observer II people tracker. Markus Güntensperger, Product Manager at ADEC Technologies said: "Following the introduction of the Observer One last summer, we are extremely excited to announce the immediate availability of the powerful Observer II people counter and tracker.